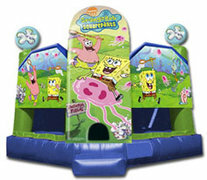 Get Your Squarepants and Jump! Description: Are you ready KIDS? Aye, Aye Captain. We will be traveling to Bikini Bottom where SpongeBob, Patrick and the rest of the gang will take us to the Krusti Krabs and have a Krusti Jumpburger. I am ready; I am ready!